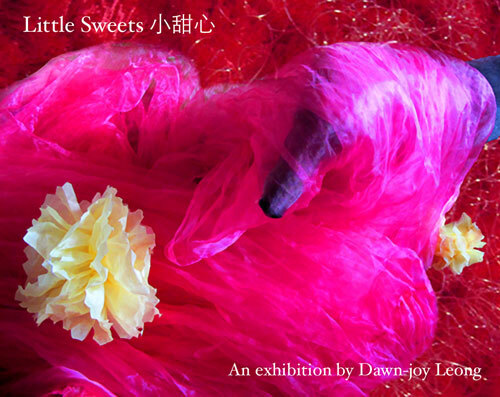 “Little Sweets 小甜心,” is an invitation to share empathic imagination with the hypersensory realm of autism. Second in a series of installations bringing together perspectives from neuroscience and multidisciplinary art, this installation extends a palpable yet humorous landscape of sensory idiosyncratic challenges from within the conundrum of autistic parallel embodiment. A snapshot of hypersensory oxymoron. A suspension in time and space. Visual, tactile, kinetic, proprioceptive, auditory, olfactory, gustatory. Refracted fragments of pleasure and pain, seeking and avoiding, reaching and recoiling, strategising, overcoming and navigating. Protracted 30-second journeys. Hyper-real. Juxtaposed. Fluid. Concrete. Ephemeral. Polymodal. Engaging with Self and Other, animating the inanimate, parallel revelry without the need for verbal encroachment. Important Note: This work is inspired by canine sensory studies, sensory based approaches in the training of young working dogs, and the correlations with sensory idiosyncrasies in Autism Spectrum Condition. In honour of Lucy, who is one of my most important muses, I will be donating entire proceeds from the sales of my installation pieces to Greyhound Rescue. This will be the first time I am actually selling any of my art pieces, since my focus is more on creating conceptual spaces. The individual items are not what one may consider ‘high art’ but they will definitely make fun and quirky Christmas decorations, and I hope to be able to give something back to the community of dogs from which I have derived so much. Photologue: from Works in Progress, to Opening Night, and Beyond. Video: the realisation in motion and sound. Good evening everyone and thank you for coming to my exhibition. I will make this description as brief and simple as possible, so that the main focus can remain a sensory experience, rather than verbal homily. In this conceptual-physical space, I explore ideas of sensorial empathy, parallel embodiment, performing the ordinary, while contemplating the effects and challenges posed by pieces of daily life, from the perspective of Autism Spectrum Condition. Regardless of neurological make up, I am sure everyone knows the feeling that creeps up at some point or other in time, where we become aware or even weary of ‘performing’ the social persona. For the autistic, the performative effort is not only in the area of social interaction, but also embedded in a constant struggle to overcome sensory idiosyncrasies, mainly that of overload as a result of hypersenses, and other anomalies like confusion with visual spatial judgment in relation to our bodies and proprioceptive control. Put plainly, not only does the autistic person need to deal with our own complex and quirky responses to the environment – the texture of fabrics against our skin, the ground we walk on, light, colours, sounds and smells from other people, objects, foods and surrounds – but we also simultaneously face and juggle the conundrum of social engagement, something which even many non-autistics find daunting on its own. An almost desperate and rigid need for structure and predictability is a well documented trait of autism, which is a way of creating a mental and operational safe haven in response to the struggle with constant sensory bombardment. However, life is full of the unexpected, especially when living in a widely neurodiverse society. Although this exhibition was originally designed to reflect dynamism and self coping strategies, I was completely unprepared for the actual turn of events when I arrived on site on Saturday morning for the setting up. To my utter horror, I found that this space had been double booked, another student’s work was occupying the space, and I was informed that I could not access the venue until 1pm on Monday. Bearing in mind that I had planned for a two-day set up of a complex conceptual space, being faced with the prospect of either having to cancel the event, or achieve a decent set up within 4 hours would be something that nobody, regardless of neurological predisposition, would find any delight in! At that point, I was conscious of my own inclination to postpone the event, because there was just no way I could achieve the original plan within 4 hours, and the autistic desire for perfectionism, adhering to structure and focusing on detail is extremely strong. However, I had made a promise to Greyhound Rescue, sent out all publicity material, generated a lot of interest in my neighbourhood in Paddington and beyond. That was when the other autistic trait kicked in: the rigid and inflexible determination to honour my commitment, no matter what. I knew then that I had to force my brain into emergency mode and begin to re-strategise. I sent out a rather panic stricken email to my supervisor, Professor Jill Bennett, explaining the situation, and babbled a bit thinking out loud at my friend Rick (who was with me at the time) and then embarked on a different plan of action. I decided that the entire exhibition will have to take on an experimental aleatoric dimension, where I will work within the limitations and see what happens when it happens. In the meantime, Prof Jill so kindly sent an urgent email to Allan Giddy, who was supervising the student whose work was occupying the space, to see if I could have the space earlier than 1pm. I was most grateful and relieved when, on Sunday, Allan replied to say he had made the necessary arrangements and I could have the space mid-morning instead of 1pm. I would like to thank Prof Jill Bennett and Allan Giddy for your kindness and patience, especially because my emergency intruded upon your weekend. Performance is a key element in coping strategy. Coming from a background in music and the performing arts, my own attitude towards performing life itself is largely a positive one. The truth behind musical improvisation is that it is far from ‘random.’ The best improvisors, from J.S.Bach to the Jazz greats, draw from a vast library of ‘riffs’ – sensory, sequential, rhythmic, patterned bits of data developed and refined through years and years of exploration, repetition and practice. At the moment of the performance, one draws from this vast library that has already become part of the fabric of Self, while interacting with Others and the elements. Very often, the unexpected happens, but that is all part of being prepared, expecting the unexpected and performing life in the moment. It is demanding, tiring, exhausting and constantly pushes one outside of our comfort zones or beyond perceived limits, but it can also be exhilarating and fulfilling. To me, this is not very far removed from training a dog to share our human domain. When we teach a dog to sit, walk on leash, eat or stop eating on command, etc. the dog is learning new behaviours, in order to please their humans. There are different approaches, but my preference is for positive reinforcement, rather than a heavy handed authoritarian one. This is in line with how I would like learning programmes for autistic individuals to be conducted: encouraging, adapting and changing behaviours by developing and strengthening intrinsic abilities, and making the experience a pleasant and rewarding one. This exhibition is thus inspired by Lucy. Lucy is my constant companion, and the different facets of our life together weave into a rich tapestry that encompasses many dimensions. In my quest to understand her better, I stumbled upon canine sensory and cognitive studies and sensory-based behavior training. The more I observed how Lucy deals with her senses, the more I wondered how I can employ similar strategies to my own autistic hypersenses. This space was conceived and designed in response to a series of training methods employed to help young working dogs overcome their sensory fears and aversions, in order to confidently navigate the bombardment of stimuli in their future working environment. Put simply, rather than merely de-sensitising, it is more a kind of reward-based challenge to perform and function within a different personification. The connection with autism hypersensitivity is very strong: bypassing the verbal didactic, addressing the senses directly, and offering a positive experience in exchange for the effort of negotiating the daunting. In honour of Lucy’s valuable contribution as my muse, I shall be donating all proceeds from the sale of my installations to Greyhound Rescue. They may not be valuable works of art, since it is a conceptual space, and I work mainly with recycled and pre-existing material, but Christmas is just around the corner and I think you will find some fun and quirky Christmas decorations here. I urge you to please support this very worthy cause. As you enjoy the wine, juice and cupcake, do take the time to experience the various components in the space. And of course, stop to chat with Peter and Janet of Greyhound Rescue, who will be most happy to tell you more about their work rescuing and rehoming former racing Greyhounds. Information material will also be placed at the reception table.